We all face a fair amount of stress in our daily lives. Deadlines. Work issues. Money problems. Family challenges. Health issues. Any one of these stressors can tie us up into a knot of worries. It’s important to find strategies to control and reduce stress. Over time uncontrolled stress can cause physical problems (headaches, fatigue, sleep problems, chest pains), mood changes (anxiety, irritability, depression) and behavioral problems (overeating, undereating, drug abuse, outbursts). 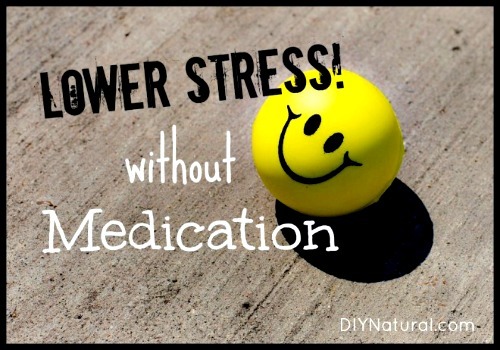 In this article Nina of DIY Natural shares 10 ways to lower stress without medication. She includes positive behavioral changes, essential oils (with recipes), a beneficial mineral, and more. Click on the 10 Ways to Lower Stress Without Medication link below to see all 10 stress reduction methods. It could literally improve your life.